In May I was part of an afternoon of art and poetry centered on the theme of art practice and spiritual practice. The afternoon came about after one of those meandering conversations that takes place repeatedly and over many years. I’ve been thinking and practicing with the connection between art and spiritual practice with a small group of artists I continue to study with in Italy, with my Zen teacher, poet Norman Fisher, and with other artists who are part of the Everyday Zen Sangha including sculptor Marshall Elliott and painter Eva Bovenzi. We were delighted that more than fifty people braved the Memorial Day traffic to join us for an afternoon of looking, listening and contemplating art, poetry and the interesting parallels between contemplative practice and art making. We enjoyed a wide-ranging discussion with the group and hope this sets the stage for further conversations. True to my love of list making, I contributed the following observations on this topic as reflected on my own experience over the last decade or so. I could write an essay about each of these, and perhaps someday I will. But for now, here they are in no particular order. Spiritual practice and art practice . . . Both pursue questions or instincts that the rational mind cannot immediately grasp. Both benefit from an understanding of lineage and a respect for what has come before. Both are full of techniques that guide the practitioner in her discovery of the work and life she was meant to make. Both are based on a foundation of solo inquiry and communal celebration and support. The studio, like all places of worship has its rituals. At the heart of both art and spiritual practice is an aspiration for revelation: to see more deeply, listen more expansively, and speak more honestly. Central to both practices is humility about control, and an openness to what comes next. Both recognize the need for quiet places of retreat for the purpose of focusing the mind and opening the heart. Both maintain a complicated and sometimes fraught relationship to the marketplace that requires careful, soul-searching and attention. To the rest of the world a spiritual retreat implies the need to erect some kind of border or fence, however temporary, between you and the rest of the world. Retreat can suggest a sort of gate that closes behind you as you enter a world of silence and meditation. And on some level this is certainly true. But like all assumptions, the closer one pays attention the more things change. For one week, each year I attend a silent meditation retreat. And each year, although it may appear that I am leaving the world, day after day of meditation I find myself getting closer to the world. The Italian word for gate is cancello, which for me, reinforces the one-way purpose of gates. But retreat is about opening gates as much as it is about closing them. So it was with amused interest that I began to take note of the driveway gates in the wealthy suburban neighborhood that surrounds the monastery campus. Each afternoon I would take a walk along the same stretch of road. (The name of the road itself, Deer Park Lane quietly referencing the holy site where the Buddha is said to have given his first teaching). In my survey of no more than 500 feet of roadway I noted a typology of gates that seemed to mirror my own meandering relationship to the rest of the world. My growing intimacy with these structures was only heightened by this awareness. Here they are in no particular order. There is the gate so in love with its own image that the exterior world, like Plato’s cave, seems to be nothing more than a surface on which to project itself. It is a gate of limited, but strongly held certainty. Here lies a form not yet aware that its size is nothing more than the play of light and shadow. There is the gate of the self-contained imagination. The winding road leads clearly around the bend up ahead, but we cannot see where it might take us. It’s intriguing, but, on closer approach we on the outside are not invited to penetrate its very solid perimeter fence. There is the no-way-no-how gate. This gate demands that you not even look in its general direction. Here, a presence fortifies itself with other gates, just in case. Then it unconsciously configures the objects of its own housekeeping in such a way to ward off curious onlookers. There is the non threatening gate, whose exterior and interior landscaping suggests an unbroken continuity. If you enter this gate, the wide gapped fence promises, you will find more of what you already know: the same red flowers, the same greenery. But don’t be fooled. On approaching this particular gate, one gets the first glimpse of something wild (in this case a metal sculpture of a horse) leaping through the middle ground of the interior. There is the hidden gate; the one that offers no glimpse of what might lie on the other side and yet intrigues by virtue of its plain beauty. Perhaps its quiet, understated edifice belies a deeper knowledge. A patient awareness that knows eventually we will notice its doorway, even if it is streaked in shadow. And finally, there is the come-and-stay- awhile gate. In this gate, that is not really a gate, what you see is what you get. One feels the full openness of a structure that has come full circle in its understanding of fences and borders. We are invited to walk through the gate, take a seat even stay a while because life is short and the view from here, so expansive. I've looked at Pop From Both Sides Now. . . The painter James Rosenquist died last month. I’ve become reacquainted with his work this year thanks to SFMOMA. I serve as a tour guide a few times a month there and every so often I often find myself sitting on the gallery floor with a bunch of elementary school kids in front of Rosenquist’s massive painting A Leaky Ride for Dr. Leaky. The painting is a bold mix of images and colors drawn from classic advertising tropes and woven together with the sure hand of the sign painter, which Rosenquist was before turning to studio art. The brash and bright colors are part of that crazy Pop sensibility— a nice flat rock in the art historical stepping stones that seem to link abstract expressionism and post-modernism. Roy Lichtenstein, Live Ammo (Tzing), oil on canvas, 69.5" x 57.5", 1962. Courtesey of SF MOMA. Though one cannot deny its conceptual importance, I’ve never much cared for Pop Art visually, be it Warhol, Rosenquist or Roy Lichtenstein who painted those Ben-Day dots with such loving attention. Unfortunately, this punch-in-the- face approach to advertising has only intensified since Pop’s heyday. Perhaps it comes from my experience working on land use and urban planning, but I hold particular disdain for the way corporate advertising now plasters our once shared and ad-free public spaces like bus shelters and public transit stations. A few days after reading about James Rosenquist’s death I found myself on the wrong side of a Muni bus headed to my studio in the southern part of the city. I say wrong side because it was the slightly dim, colorless side of the bus where not only the bus, but also the windows are wrapped by advertising. Staring out the window, I felt like I had crossed a new and disturbing threshold in the corporate media drenched culture. I was no longer outside in the “real” world looking at (or trying to avoid looking at) the advertisements. I was now stuck inside a giant rolling advertisement trying to look at the world. Instead my view was obscured by so many grey Ben-Day dots, it was hard to know what I was looking at. A sad day for daydreaming through the bus window. A sad day for the ad-free commons. But maybe a good day for artists. . .
At least viewed this way, the ad looses its intended meaning and creates (quite literally) a window through which to view the granularity of the world. A good reminder that things are not always as they appear to be. A truth we all need to be reminded of. This teachable moment brought to you by Roy Lichtenstein via Clear Channel Advertising and SF MUNI. For now however, I'm sticking with the view espoused by Carolyn Caldwell and RJ Rushmore and their Art in Ad places campaign. Its time to take back these public spaces and beautify them with art and something drawn by the hand. Until we get real policies in place to protect the ad-free visual commons, these guerrilla tactics will have to multiply. Noel'le Longhaul, Absence. Photo by Luna Park. Courtesy of Art in Ad Places. Change is afoot in San Francisco and nowhere does that seem more apparent than in my studio neighborhood South of Market. In the 1970's and 1980's artist Janet Delaney began chronicling this neighborhood and the places and lives that were being transformed at the time by a wave of urban renewal efforts. My studio sits above Klockar’s Blacksmith shop which looks very much like it did when Delaney photographed it. The picture above was included in a survey of her work at the DeYoung Museum last year. Fast forward thirty six years and here we are again. This time, a new form (the high rise condo tower) is rapidly replacing the empty lots and low rise, light industrial buildings left in the wake of the last round of urban renewal. Every day I marvel at how much new development has transformed what used to be the dominate form and scale of this neighborhood. I am reminded of a book I used to love as a kid called The Little House by author and illustrator Virgnia Lee Burton. In the story, a little house in the country gradually becomes surrounded by other homes, then a road and finally a city with an elevated transit system. Some days in the studio I feel I have stepped inside the pages of Burton's book. Compare the images above and below this text. Being a children’s book published in 1942, the solution to the drama and crowding of the city was for the little house to be put on a trailer and driven to a new pristine location in the country. Problem solved! Here on Folsom Street my little studio building remains an anachronism. But it feel like an important and necessary wrinkle in the fabric of time. On the increasingly busy sidewalks surrounding this block, I feel a kinship with the ghostly figure in the famous picture by Daguerre taken in 1838. Louis Daguerre Boulevard Du Temple, 1838. Although Daguerre's Paris street scene was bustling with traffic and pedestrians, none of them show up in his image. His early long-form exposures did not work well for taking pictures of moving crowds. Nonetheless, Daguerre managed to capture his first photographic image of a person entirely by accident. 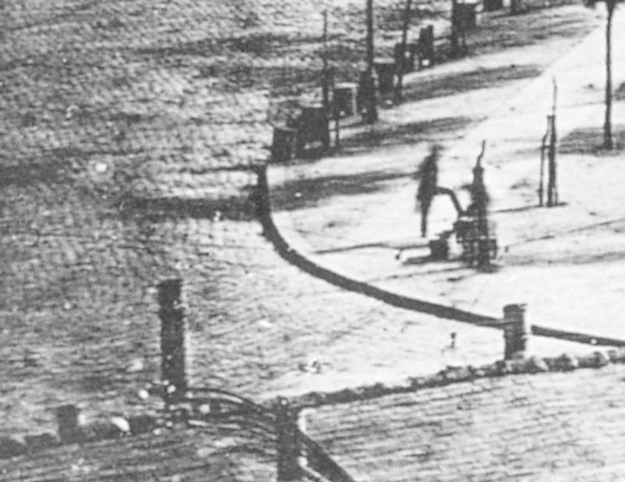 The man having his shoes shined near the bend in the road was the only person on the street who stood still long enough to be "seen" by Daguerre's technology. There is power in stillness, perhaps even more so today. As I often do when reading the work of a kindred spirit, I find myself inserting the word “painting” or visual art where he refers to film. Dorsky discusses the two kinds of time that are central to a film’s materiality. The first is relative time—the way a story moves from the opening shot to the last frame and all the dramatic movements in between. Think of it as linear time. For film to have a devotional quality, it must accomplish the difficult task of balancing these two kinds of time. Dorsky points to Carl Theodor Dreyer’s 1928’s silent film The Passion of Joan of Arc as an example of a film that strikes such a balance. Dreyer’s emphasis on point of view and skillful editing of montages, brings us directly into a compassionate presence with Joan’s suffering even as we move through the relative time of her story. I remember seeing The Passion of Joan of Arc many years ago at the Paramount Theater in Oakland where the 200-member UC Berkeley Alumni chorus and a 22-piece orchestra performed an oratorio written by Richard Einhorn as accompaniment to the film. Once the film started, I could not for the life of me figure out where the chorus was standing. There wasn’t any room for them in the orchestra pit. Nonetheless, their voices felt all encompassing and integral to my experience of the film. It wasn’t until after we reached the climatic final scene of the movie that I realized that some 200 members of the chorus had been sitting with us the entire time. Choral members had been seated in various rows of the theater, singing beside us, behind us, in front of us as we sat together in the dark while the film’s light flickered overhead. When I rose to add my applause to the standing ovation I felt that deep sense of relative time mixed with a commanding sense of the now. One of my favorite books is a collection of essays by Lawrence Weschler titled Everything That Rises, A Book of Convergences. In the book Weschler uses the essay form as a dynamic thread that weaves together art and visual culture, history, memory and serendipity. He also finds ways to connect seemingly disparate topics into short pieces that are as delightful to read as they probably were to write. Since reading his book, I’ve been more aware of my own experiences with visual art convergences—places where images from art history reach forward to inform, deepen or perhaps reshape what I am seeing right now. Here is one I was reminded of while traveling last fall. Deposition From the Cross, Filipino Lippi, panel from Altarpiece, 333 x 218 cm, Galleria dell'Accademia, Florence. The Deposition from The Cross by Filippino Lippi was completed in 1506. I was immediately struck by this piece after seeing it for the first time several years ago at the Academia in Florence. The colors are vibrant, the scene dramatic, and in his focus on movement and gesture, Lippi has choreographed a balanced but active dance of limbs and bodies in the upper half the painting. As I learned later, Lippi actually only painted the figures on the ladders as the rest of the painting was completed after his death in 1504 by the painter Pietro Perugino. 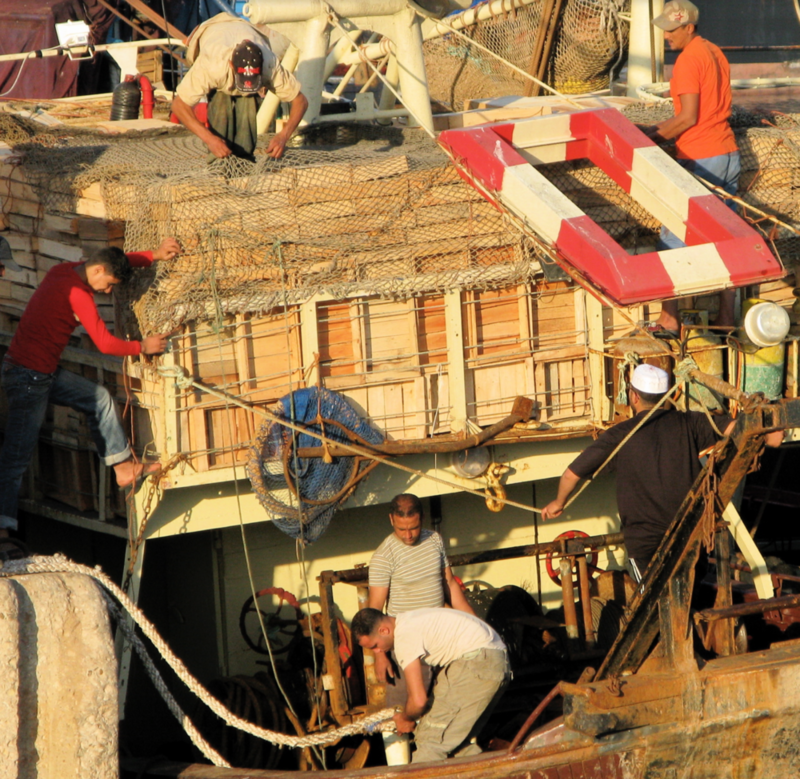 Years earlier before I had ever set foot in Italy, I snapped the picture above on a trip along the coast of North Africa at a busy shipping port in Mauritania. I was struck when the image ghosted back up on my computer screen recently and thought immediately of the panel from the Lippi altarpiece above. Here are the two images side by side. The figure of Christ is not present from the "convergence" photo, but perhaps the cross is still there in the wooden slats and uprights that occupy the empty space in the center of my photo. Nonetheless, the gestures of work and care and shared endeavor are there. Look at the hands of the man leaning over the net at the top of the photograph and his counterpart holding Christ’s arm at the top of the painting. The two men in red shirts at the middle left and upper right of the photograph find their counterparts in roughly the same position in the painting. They echo the arm gestures and drama of balancing a single foot on a ladder. Here two images separated by over five hundred years come together, but why? Perhaps to remind us about the power of bodies joined in shared effort. Or perhaps to underscore the importance of labor and effort in any endeavor be it spiritual or secular. Or maybe, well I could go on, and I will as I think more deeply about why these two images have converged. Let me know if you have any thoughts. Tomb of the Diver, Fresco, 500 B.C.E., Paestum, Italy. Archeological Museum, Paestum. One of the highlights of my recent trip to Italy was the opportunity to explore the archeological remains of the city of Paestum, which lies near the southern city of Salerno. The ruins are magnificent for many reasons including the incredibly well preserved Greek Temples dating to 510 to 520 BC.E. The image of the diver, arcing gracefully into the void continues to haunt me. By some accounts the tomb, which sides are painted with tender frescoes of a Greek party or symposium, conjures Plato’s dialogue about the nature of love. In his hierarchy, love moves from physical beauty to moral beauty to love of knowledge and finally to the love of absolute or divine beauty. Interestingly, Plato wrote the dialogues more than a century after this tomb was painted and covered with earth. The diver is a literal and figurative capstone to the movement from the world of the senses to the world of the spirit. The diver’s perfect form sails out across the known world as depicted by the Gates of Hercules and into the empty space above a pool of water. I am moved again and again by the spare elegant power of this image. May we all dive with such ease into the unknown of the New Year. I’m back after traveling for several weeks through Italy, taking pictures, looking at art work, meeting with old and new friends. It was a great trip. This will be one of several blog posts in which I hope to share some of what I have been thinking about and bringing into the studio since that trip. As my art practice is driven by an effort to understand emptiness and form and metaphors for the ineffable nature things, I was drawn again to Renaissance Altarpieces. Here’s one by Giovanni Bellini in Venice. San Giobbe Altarpiece, Giovanni Bellini, oil on panel before 1478. Now in the Academia in Venice. Belinni has created an entirely convincing chapel niche with Mary seated on a throne with the infant Christ. A darkened lamp hangs over head even as the divine light illuminates the figures below. Saint Frances on the left with an outstretched hand, beckons us into the space. It is that interior space of the niche and the questions about what is outside and inside that intrigues me. Renaissance altarpieces are rife with all kinds characters and objects that serve to bridge the gap if you will between the sacred and the profane. Detail of the Otto Pratica Altarpiece by Filipino Lippi. Reframed and located at the Galleria Uffizi, Florence. The St. Lucy Altarpiece by Domenico Venezianno is another piece that I had the pleasure of taking a long look at one afternoon at the Uffizi. St. Lucy Altarpiece by Domenico Veneziano, tempera on panel 1445-7. Located at the Galerie Uffizi, Florence. 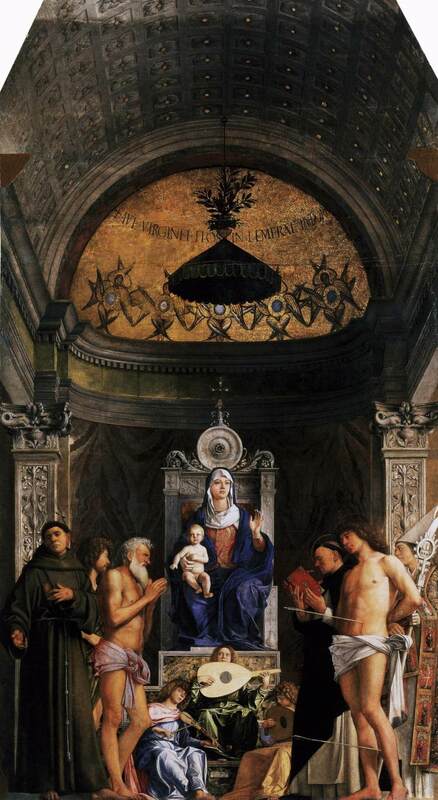 Originally designed for the Florentine church of Saint Lucia dei Magnoli, this altarpiece also invites the viewer into the scene, if not the actual niche where Mary resides. The figure of John the Baptist on the left engages us in a space that is designed to hold the figures in the painting and viewers just outside the paitning. Nonetheless, John the Baptist invites us to go deeper into the niche behind him. Here natural light from above illuminates the mysteries of the space. The shape of a niche, its implication of quiet contemplation has captured my imagination for a while. Once I started looking, I found a lot of versions of these shaped openings on my trip. I am drawn to empty niches in particular for their ability to hold a wide variety of silences. Here are just a few. Wolfgang Laib sifting hazelnut pollen, 1992. Courtesy Sperone Westwater Gallery, NYC. A couple years ago I had the opportunity to view one of Wolfgang Laib’s pollen pieces at the Seattle Museum of Art. If nothing else, the work is certainly more than a sum of its thousands of pollen grains. Laib spends days collecting these golden grains by hand and then meticulously spreads them into a square which can be viewed from many angles. By patient accumulation, Laib creates beautiful hoverings of pure transcendent color. From accumulation of color, my mind drifts to accumulation of form. And then the wonderful phenomenon called murmuration when hundreds, sometimes thousands of starlings or blackbirds gather and shift their collective selves over the sky. If you haven’t watched this video already, its one of my favorites. Murmuration. The word itself is the sound of the world coming into being. Those lulling mur, mur’s conjure the slow emergent nature of things. In the studio I’ve been working with my own slow accumulations. Tracy Taylor Grubbs, Blue #4, Rollerball pen on paper, 25" x 30"
Using a blue roller ball pen I’ve been drawing one slow line at a time, accumulating hundreds of lines over many drawing sessions. In the process new and unexpected forms emerge. What I like about this particular drawing practice, is that each line registers a unique response to breath, pulse and the subtle grips and shifts of the body. Each line relates to what has come before and to what will come after. But with time and accumulation these drawings offer up something new, unified and greater than the sum of their parts. Perhaps that is something that the world needs now. A reminder of the eternal that is buried deep inside the ephemeral nature of things. Tracy Taylor Grubbs, Blue #5, Rollerball pen on paper, 25" x 30"